In this article, we will learn how to deploy a Blazor application on Firebase. We will create a client-side application using Blazor and host it on Firebase. 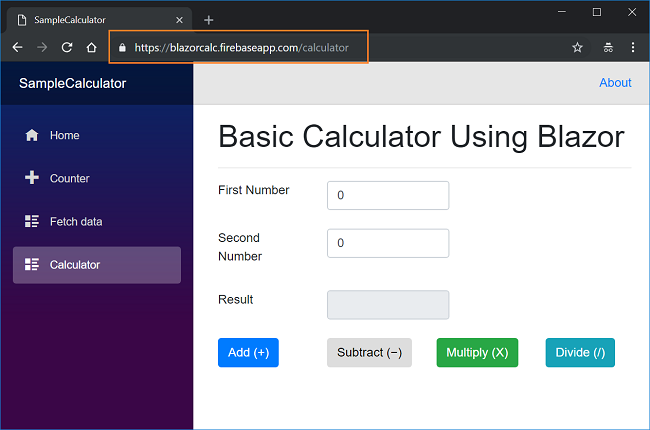 For the demonstration of the process, we will create a basic calculator app using Blazor and host it on Firebase. This application will not have any server-side code or Web API logic. We will use Visual Studio 2017 to build and publish the application and will use CLI to deploy the application on Firebase. You need to install the following prerequisites to create a Blazor application. 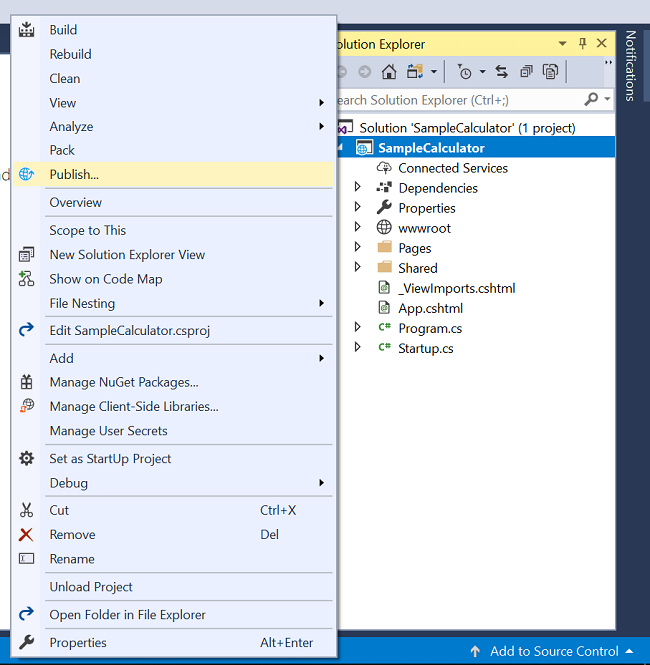 Open Visual Studio and select File >> New >> Project. After selecting the project, a “New Project” dialog will open. Select .NET Core inside the Visual C# menu from the left panel. 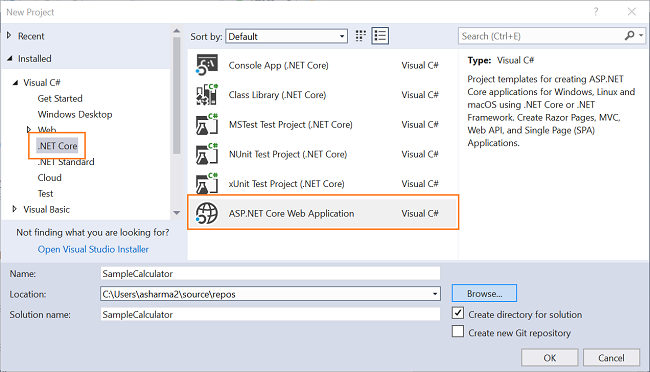 Then, select “ASP.NET Core Web Application” from available project types. Put the name of the project as SampleCalculator and press OK.
To create our component, right-click on SampleCalculator/Pages folder and then select Add >> New Item. An "Add New Item" dialog box will open, asking you to select the desired item template from the provided list of items. 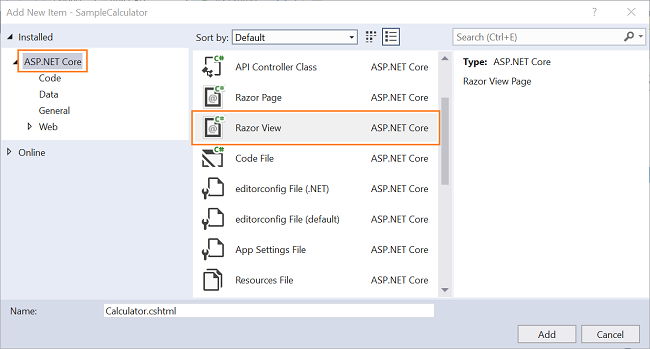 Select ASP.NET Core from the left panel, and then select Razor View from the templates panel. Put the name of the file as Calculator.cshtml and click "Add". Open the Calculator.cshtml file and put the following code into it. Add the navigation link for this component in Shared/NavMenu.cshtml file. Press F5 to run the application and you can see the output screen as shown in the image below. This application is still in the development environment. Before hosting it on Firebase, we need to publish it. Right click on the project and click "Publish". Refer to the image below. You will see a screen similar to below. Select Folder from the left menu and provide a folder path. You can provide any folder path where you want to publish your app. Click "Publish". 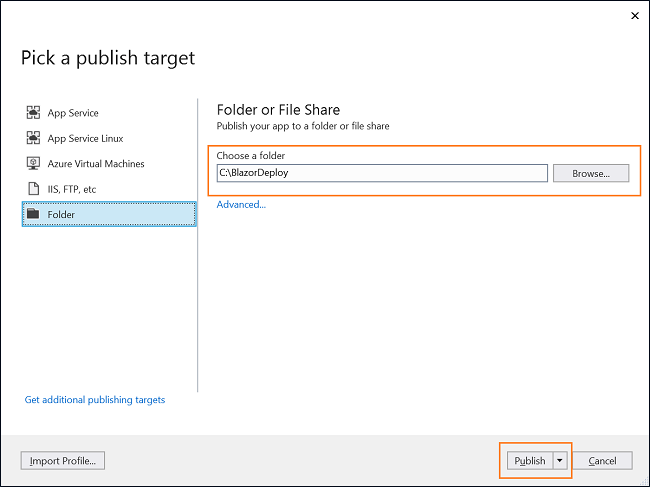 Visual Studio will start publishing your application. If there are no build errors, then your application will be published successfully to the folder you have mentioned. Navigate to https://console.firebase.google.com and sign in with your Google account. Click on “Add Project” link. A pop-up window will open, as shown in the image below. Provide your project name and click on “Create project” button at the bottom. Note the project id here. Firebase project ids are globally unique. You can edit your project id while creating a new project. Once the project is created, you cannot change your project id. We will use this project id in the next section while initializing our application. Open the folder where you have published your Blazor application. Here you can see a folder “SampleCalculator” and a web.config file. Inside “SampleCalculator”, we will have another folder with name “dist”. We will publish the contents from this “dist” folder. Open a command prompt/PowerShell window inside the “SampleCalculator” folder. Now, follow the steps mentioned below. It will open a browser window and ask you to log into Firebase. Log in using your Google account. Upon successful login, navigate back to your CLI. This command will initialize a Firebase project. You will be asked a set of questions. Answer them as shown below. 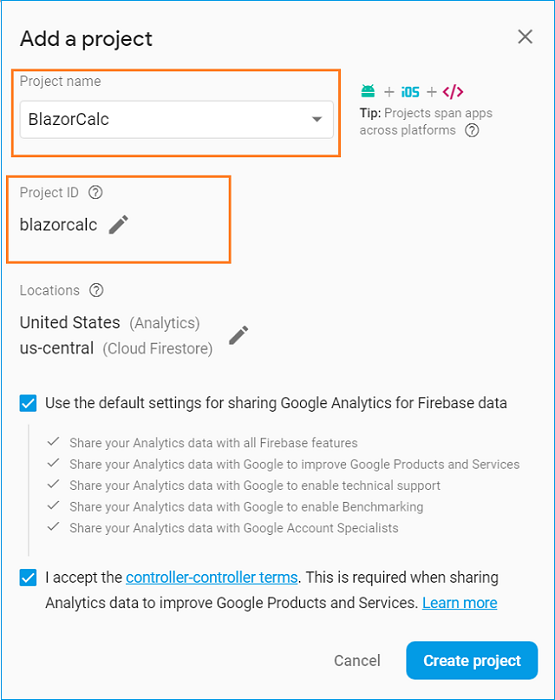 Select a default Firebase project for this directory: - If the project you added in the last section appears in the list, select it, else select “don’t set up a default project”. Finally, run the following command to deploy your application on Firebase. This command will deploy your Blazor application on Firebase and upon success, it will give you a hosting URL. All the steps mentioned above is shown in the GIF below. Open the hosting URL. You can see the application in your browser, as shown in the image below. We can follow the same steps to host an Angular application on Firebase. Run the following command to build an Angular app for hosting. 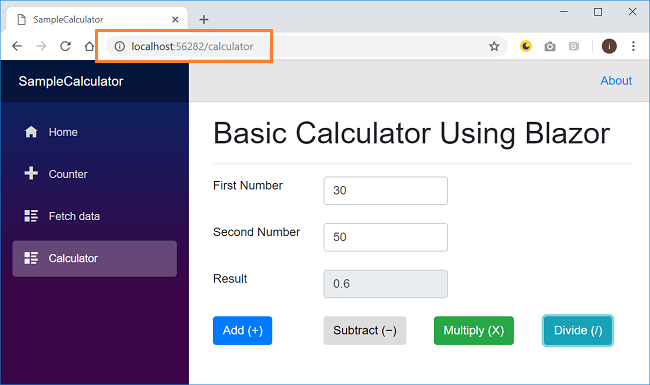 We learned how to create a simple calculator application using Blazor. We also learned how to deploy this application to Firebase. You can find the code for this sample calculator application at GitHub. You can read my other articles on my blog here.